Steven Deme is a marathon runner, a manager, and for 25 years, a TV and video producer specializing in public education projects. His portfolio includes work for his company Villagers Media Productions and, for outside clients, under his brand Demevision. 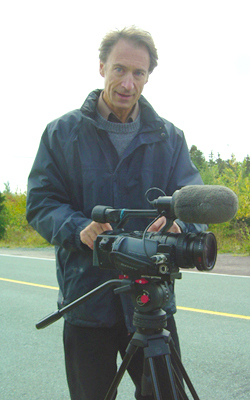 His functions include field producer, director and director of photography and cameraman. For video-plus editing plus internet uploading, he works closely with his company’s top-notch editors and web-savvy technicians. His range of projects has been wide, from children’s drama to overseas development issues documentaries. Deme co-founded Villagers Media Productions Inc (VMPI) in 1990. Based in Toronto, VMPI produces TV and DVD programming that focuses on international development, multiculturalism, comparative religion history, youth, seniors, education and health. – the creative management of productions from conception to delivery for both broadcast and on contract to a variety of companies and educational institutions. Over the history of the company, Deme has helped launch the careers of some 20 young media graduates, representing several of Canada’s diverse communities. To date, the company’s productions have been broadcast on VisionTV, Aboriginal People’s Television Network, Canadian Learning Television, Alberta Access, BC Knowledge Network and Saskatchewan Communications Network and W: the Women’s Network, I Channel. Foreign sales include TV broadcasters in Spain, Poland and Brazil. Deme holds two university degrees in communication studies: BFA, 1982, MA, 2008; Ryerson University. Fluent in English, French and Hungarian, Deme has travelled extensively in Europe and Asia for personal enrichment and professional assignments. His on-location production travels, as a director/ director of photography, include 27 foreign countries to date in Asia, Africa and Latin America: Chile, Ecuador, Peru, Colombia(2), Guyana(2), Nicaragua(2), Honduras(2), Dominican Republic, Haiti(2), Israel (2), Jordan, Pakistan, India(2), Bangladesh(2), China, Mongolia, Indonesia, Phillippines(2), Thailand(2), Sri Lanka, Nigeria, Kenya(2), Ghana(2), Rwanda, Malawi(2), Tanzania(2), Uganda(2). He has produced in Northern Canadian First Nations and Inuit locations, including the High Arctic, Labrador, Quebec, Nova Scotia, Northern Ontario, Manitoba, Saskatchewan, Alberta and BC. 1997 Taught Video Production at Centre Recherche et Communication, Lyon, France. Deme has run several marathons and half marathons and is now Boston-qualified. He has been a coach for both runners and power walkers.